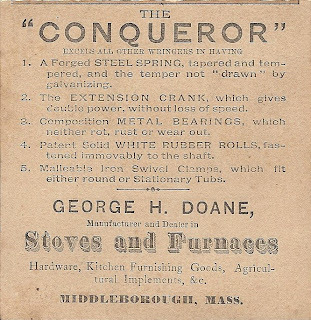 The relation between the sexes in Victorian Middleborough is readily apparent in this flip-style advertising trade card circulated by local hardware dealer George H. Doane for the Conqueror clothes wringer sometime about 1880. Little thought is given the drudgery endured by Mrs. Jones each laundry Monday, except when it interferes with her ability to have her husband's dinner ready. 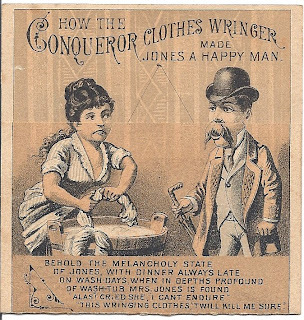 Salvation in the form of a Conqueror clothes wringer, however, has brought domestic tranquility to the Jones household, for now Mrs. Jones can not only prepare a meal in a timely fashion, but she can get the week's washing done, as well. 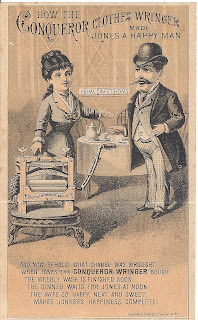 (Ironically, this labor-saving device has permitted Mrs. Jones more free time in which she may perform even more labor). Clothes wringers were developed during the latter half of the 19th century and, in fact, did make laundering less toilsome. Further, mechanical wringing was easier on clothes, as well. The device was deceptively simple: rubber covered spring-tensioned rollers in a maple frame were operated by a hand crank which squeezed the remaining water from the clothes. Such innovations were a feature of the Doane hardware store which was located for most of its history in the so-called Union or Doane Block on South Main Street, the woodframe building which stands next to the Mayflower Bank.